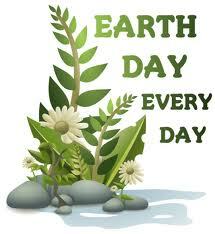 Earth Day is this coming Tuesday, April 22 and the pagan holiday of Beltane occurs on May 1. “Make every day Earth Day” sums up my feelings about commemorating Earth Day. More than renew-reuse-recycle, we need to think about what we buy in the first place. Here’s an example: what good is it to buy organic lettuce in a plastic container shipped from across the country? Grow your own lettuce in a pot on your porch! I know it is virtually impossible in today’s world to have no post-consumer waste, but the more conscious we become of what we buy, the less likely we are to buy items in plastic containers. Take a look at the horrific video on You-Tube called “The Plastic Ocean” and you’ll see Earth Day and global warming aren’t just about polar bears and car exhaust! The Beltane holiday, also known as May Day, is most often remembered from our childhood ritual of weaving brightly colored ribbons as we danced around a Maypole. 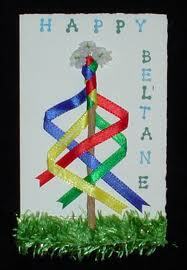 But Beltane is so much more! Beltane is both a time of thanks-giving and of supplication. Our ancestors gave thanks to the gods and goddesses that Earth’s cycle had spun once again to the quickening of life, and prayed that the seeds they planted would spring forth abundant food for all. Symbolic (and actual) fertility rites, coupled with revelry celebrating the end of a long winter were the norm in agricultural societies. While you certainly may choose to engage in such fun activities, there are some other, more family-appropriate rituals you might try as you honor the planting season. Remember planting a butterbean in a cup and watching it sprout? Do it again! Barbara Kingsolver, in her amazing book, “Animal, Vegetable, Miracle,” tells of showing school children her carrot patch. One child exclaimed how dirty they were! Teach your children well about where food comes from and how it gets to your table. As I write this, the sycamore tree that shades my patio is leafing. I try to remember to say thank you to this tree each spring as life renews itself. Try hugging a tree and listen for the life-force singing within its trunk! Beautiful post, Deb! I’ve been thinking of activities to do with my two young daughters for both Earth Day & Beltane. I just love this time of year, new life is all around us! Thank you! I hope you have a blessed Beltane with your children! May poles are great fun for kids!